Caring for a child who has CLN2 disease can be emotionally and physically demanding. Connecting with other parents and healthcare professionals can help make the disease easier to manage. Fortunately, there are support resources available to you and your family. The BDSRA is committed to providing family support services and has experience coordinating travel logistics for CLN2 families. If you have a child with CLN2 disease, the BDSRA welcomes you and wants to answer your questions. Join the BDSRA community at www.bdsra.org or 1-800-488-4570. Contact Tracy Kirby, BDSRA’s Family Liaison at tkirby@bdsra.org. Created by a family with 2 children affected by CLN2 disease, this organization has raised funds for research all over the world. 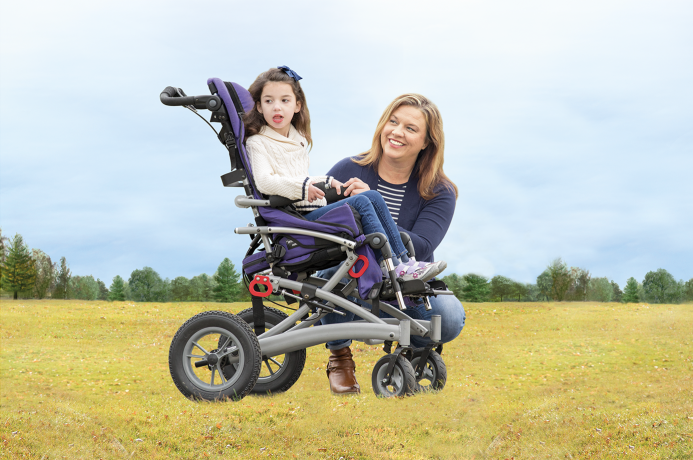 Dedicated to raising awareness and funding for research, this site shares support and experience from a family raising a daughter with CLN2 disease. 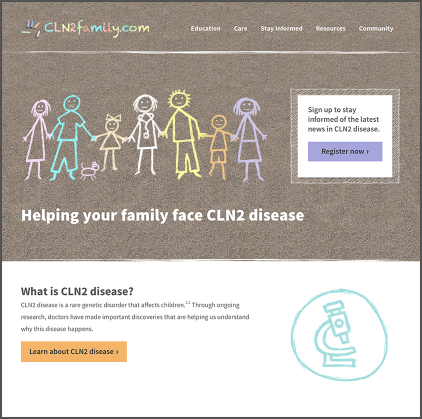 CLN2 Family is an educational resource about CLN2 disease for you and your family. Layla is a patient with CLN2 disease. She’s been on treatment with Brineura since 2015. 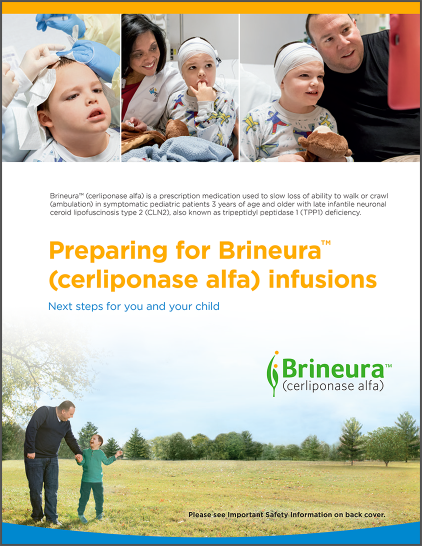 Download the following materials to help guide you on your own Brineura journey. 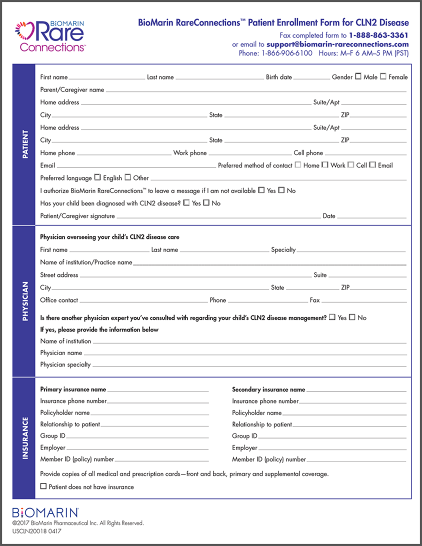 Complete and return these forms to enroll your child in BioMarin RareConnections™. This program provides individual support for patients and their families throughout the Brineura treatment process. 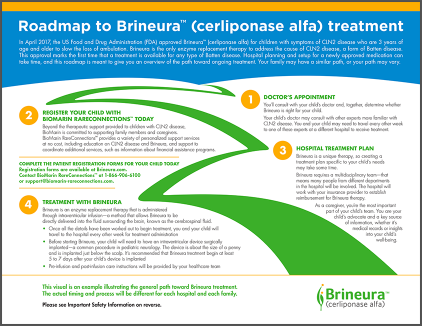 This convenient brochure gives you a quick introduction to Brineura® (cerliponase alfa) as you get started with treatment. This useful brochure helps you and your family prepare for what to expect before, during, and after infusions. This roadmap highlights major steps that you and your child may take on your road to Brineura treatment. 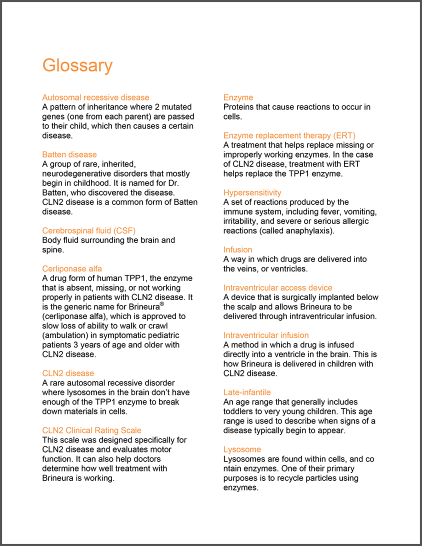 This glossary includes common words or phrases associated with CLN2 disease that may be new to you. 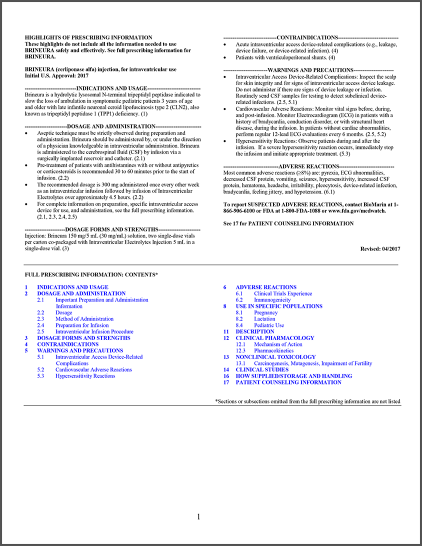 This document educates patients about Brineura. It includes instructions for use and safety information. 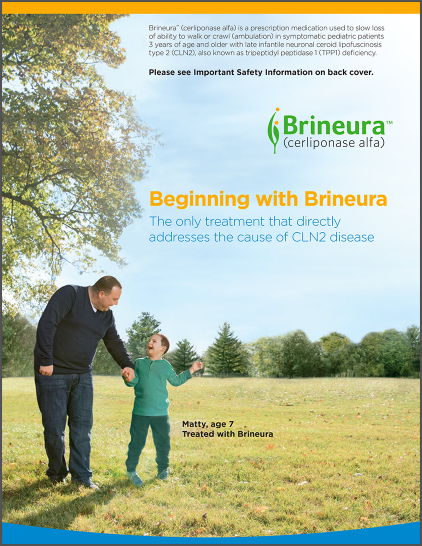 Brineura is the only treatment that directly addresses the cause of CLN2 disease. She's been on treatment with Brineura since 2015.